After I finally came down from the incredible 24-hour ego-boost, I asked my French acquaintance why he had mistaken me for French. What was it? The reason he gave was that I knew how to blur certain words into other words, in just the right way. I can promise that this came from one thing: listening to French people. Not just in person, while in France, but by immersing myself in French via massive quantities of French films. French is indeed the sneakiest language—it has the silent e, silent t, silent everything. It’s a cliche to French language learners that you only pronounce about half of any given French word. The joke is based on truth. French is a veritable minefield of silent e’s, t’s and l’s. But it’s not only sneaky because native French speakers don’t pronounce every syllable of every word. It’s also a sneaky language because so many words can and should be mushed together. In fact, it’s technically wrong if you don’t blur the lines between certain adjacent words. French films are incredible tools for learning a more natural, native way of speaking because they’re substitutes for pure immersion. You can “live” those everyday situations and learn what words work when. You can learn how to say any given sentence in a laid-back way versus a serious, formal way. You can pick up shortcuts and learn all the acronyms that the French so love to chop good, solid words into. Native French speakers take all the shortcuts, just like you probably do when you’re with your friends. How can you learn the art of mushing your words together and get to that golden moment of being mistaken for a native French speaker? Immersion. Or, lots and lots of French films. As you watch, (hopefully sans judgmental companions) repeat the phrases that you recognize aloud to yourself. Of course, this vocalization helps with pronunciation. Since you’re mimicking someone who’s likely a native French-speaking actor, you’ll naturally follow their elocution. Commit fully to reproducing the actor’s tone and emotion, whether the actor is male or female. This is easier when alone, or with a buddy who gets it. This is a time to feel playful, and the more you commit, the more you’ll memorize that pronunciation. The muscle memory will sink in as you make expressions and gestures. Your emotional memory—yes, that’s a thing—will kick in when you fully take on a role in this story and practice with commitment. Not only does the “catch a phrase” technique above do great things for pronunciation, but it also helps you to memorize new words. Repeating phrases while seeing what they mean in the English subtitles—in addition to seeing it all being played out on-screen—is a perfect combination for learning. Keep in mind that subtitles can at times be a bit imprecise, and they’re more meant to give you the gist of things rather than a perfect translation. Once in a while, ignore the English subtitles and focus on the rhythm. Spend some time focusing wholly on the rhythm of the French sentences you hear spoken in the film. As you grow aware of this, try to repeat how sentences sound without using words. The resulting sound should be something like humming, or like Charlie Brown’s teacher. This technique reveals the hidden melody of the French sentence, as distinct from your native tongue. Notice how many French phrases sound like questions in English, rising at the end—even though they’re not questions at all. Notice how long sentences have rises and falls within them, and when those occur, practice saying those sentences aloud. If you want to remember anything that you just learned watching that movie, you better have brought a notebook with you. This will help you capture any new words you glean from the subtitles so you can practice them later. While this is the fun side of French learning, it doesn’t mean you can throw your devotion to memorization out the window. As you watch, try to jot down sentences you hear quickly. See if your French spelling holds up to this little speed test. Double points if your subjonctif (subjunctive) can keep up. How long can you last? Try pushing your limits. If you initially think you can only last five minutes and still retain a decent level of interest in the film, try 10 minutes. It’s so important to stretch yourself in this way and give yourself a challenge. You’ll surprise yourself with how much of the language you’ll catch. If you haven’t experienced true immersion, this is the best practice for it. You’ll learn to grasp at the words you do know and contextualize. You’ll also realize how little you need language at all, thanks to expressions, gestures and context—which is oddly comforting. This is a time to forget about grammar. I’ll say that again, because its probably hard to believe, coming so soon after my lecture about notebooks. This is a time to forget about French grammar. There is a time and place for French grammar, and that time is every time and every place, except for this one. French movies have a different lesson for you. This is all about pronunciation, colloquial phrases and immersion. Having reserved times for practicing your French without worrying about grammar can do some good, if you don’t overdo it. Quick cautionary tale: One time I forgot about grammar too much and then my French sounded like garbage. So, you need to care about grammar just a little bit. If you take this no-grammar practice time seriously, letting go of the need to speak correctly every second can make you braver in your French. Letting go of the need for perfection can mean the difference between actually talking to people while on your expensive trip to France and being terrified to ask the waiter for more bread. The regret you’ll feel if you don’t get comfortable (even with your imperfect French) is worse than the regret of having someone correct your bad French grammar in public. So, use this movie time as a safe space to get tongue tied and love it. Only then will you learn which words you can mush together, and which should stay on their own turf. I can tell by looking at you that you’ve already seen “Amelie” and “L’auberge espagnole” about ten times each. Cinema is one of France’s great passions, so it’s time for you to go a little further down the rabbit hole. These films will you teach you French cinema while they help you practice talking like real, live French people. So, in the 1960s, the French were obsessed with American gangster films. Case in point: This movie. This movie will show you, via unexpected jump cuts and other filmmaking oddities, what Jean Luc Godard means to French culture. 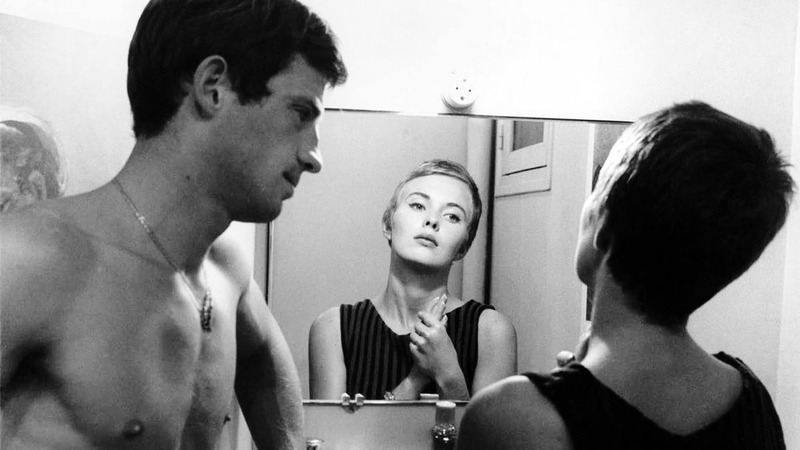 As a plus, the female lead, American actress Jean Seberg, speaks French slow enough that you’ll catch every word and end up feeling very, very fluent. See how many scenes you can watch without looking at the English subtitles! This is a great one for any beginners out there. This 2013 film won la Palme D’Or, the highest award at le festival de Cannes (the Cannes Film Festival), which should tell you that it’s great and also somewhat unique. Being a coming-of-age drama, this will show you how the teens talk these days, while supplying a heady amount of drama to reenact from your couch while Netflixing and chilling. A beautifully artful, modern French film, “Bande de filles” is filled to the brim with new French slang for you to try on, showing a slice of French society you don’t always get to study in a classroom setting: African-French female gangs. If you’re a film lover, the cinematography will knock your socks clean off. If not, you’ll still get a chance to learn a little more about how real people talk in urban France. Here’s a mish-mash of short films taking place in France in French, by a slew of international filmmakers. “Paris, je t’aime” will give you a variety of different characters with different emotions to mimic, and thus, a ton of new colloquialisms from every area of French society. You can also work with this film by breaking your sessions into pieces—try watching one a day for a week. This one is also great for beginners, because there is some English sprinkled throughout as well. A 2010 romantic comedy about two adorable individuals who are made for each other but too shy to talk about it. This is a great one because it’s simple enough that you can probably get through a few scenes without looking at the subtitles, and it’s so engaging that you’ll want to keep watching. Sometimes the simpler films are best to get your practice in because they’re easier to follow and you can truly focus on your pronunciation. Just remember: Play with the subtitles—now you see ’em, now you don’t! Make it fun to practice your pronunciation, because this is where you get to forget about perfect grammar. Keep at it, and maybe someday you’ll finally be mistaken for being a native speaker. Don’t just wait for it, though. Go out and get it! Or rather, go in, make some popcorn, sit on the couch and turn on one of the aforementioned flicks—not to be confused with flics, (verlan slang for “cops”). If you like learning French with movies, then you won’t want to miss FluentU. FluentU makes it possible to learn French from movie clips and trailers, TV shows, music videos, inspiring talks… basically anything that native speakers love to watch! FluentU has interactive captions that let you tap on any word to see an image, definition and useful examples. Now native language content is within reach. And FluentU always keeps track of vocabulary that you’re learning. It uses that vocabulary to give you a 100% personalized experience by recommending videos and examples to you. You can start using FluentU on the website with your computer or tablet or, better yet, download the FluentU app from the iTunes store or Google Play store.